Are you looking for a first home or for an investment property. This could be the ideal property for you. Great first home with a modern 3 storey design, and good yields as an investment. With a cul de sac location and briefly comprising of a hall, kitchen and dining room. To the first floor there is the master bedroom with en suite and bathroom, and to the second floor there are 2 bedrooms. Outside there are gardens to front and rear. 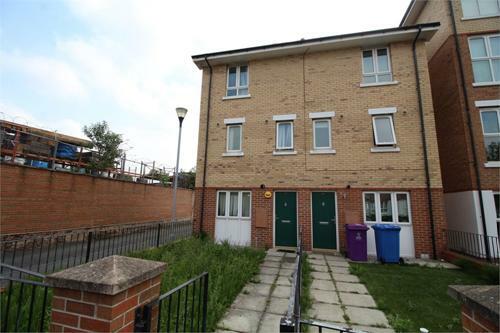 Nearby all local amenities including shops and transport links. Being sold with NO CHAIN, an internal inspection is highly recommended. Door to front. Stairs to first hall. Upvc double glazed window to front. Range of wall and base units. Integrated oven, hob and extractor. Stainless steel sink unit. Plumbing for washing machine. Upvc double glazed double doors to rear. Radiator. 2 upvc double glazed windows. Radiator. En suite. Shower unit. Pedestal wash basin. Low level wc. Upvc double glazed window to front. Panel bath. Low level wc. Pedestal wash basin. Store cupboard. 2 upvc double glazed windows to rear. Radiator. Store cupboard.